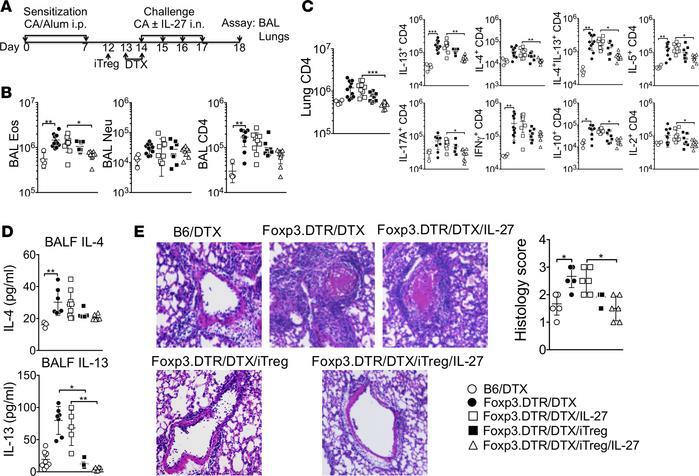 Intranasal IL-27 administration fails to reduce airway inflammation in the absence of Foxp3+ Tregs, and adoptive Foxp3+ Treg transfer restores IL-27–mediated inhibition of airway inflammation. (A) Experimental protocol. B6 or B6 Foxp3DTR mice were sensitized with CA in alum adjuvant and intranasally challenged in the presence or absence of IL-27 as described in Figure 1. DTX was injected 1 day before and on the day of first Ag challenge. In some experiments, the mice received 2 × 106 in vitro–generated Foxp3+ Tregs 2 days before antigen challenge. Mice were sacrificed 24 hours after the last challenge. (B and C) Granulocytes and CD4 T cells in the BAL (B) and cytokine expressing CD4 T cells in the lung (C) were calculated by FACS analysis. (D) IL-4 and IL-13 secretion in the BALF was determined by a CBA assay. (E) H&E staining of the lung tissues are shown (original magnification ×20), and histology score was determined. All the experiments were repeated more than twice. The data shown indicate the mean ± SD (n = 4–11). Each symbol represents an individually tested animal. *P < 0.05, **P < 0.01, ***P < 0.001, as determined by Kruskal-Wallis nonparametric test. CA, cockroach antigen; BALF, bronchoalveolar lavage fluid; Eos, eosinophils; Neu, neutrophils; iTreg, induced Tregs; DTX, diphtheria toxin.